I really like the operating system in many ways. The Metro interface is frankly charming, with its flipping tiles and integrated hubs. It’s fast, modern-looking, and integrates apps and data presentation in a way that makes the iPhone and Android look dated. Even the “wait” animation is cute: Instead of a spinning wheel, there are five little dots that zip in from one side, slow down near the middle of the screen, then zip out again. It’s the first time in a long while that I’ve been this smitten with an interface. Battery life has been impressive on both these phones, and their hardware is good (the Nokia is excellent), with gorgeous screens and excellent cameras. Browser text wrapping. This is the big one. On many websites, mobile Internet Explorer doesn’t wrap text properly. It either shows the full column width (in which case the text is too small to read) or lets you zoom in to a readable type size (in which case you can’t read the whole line). In either case, the text is unreadable. Both Android’s and iOS’s browsers handle text wrapping much more elegantly, making them much more usable mobile browsers. Gmail handling. Another big one for me, as VentureBeat has standardized on Gmail. I can access Gmail from the phone just fine, but I can’t “star” messages for later followup. Since I use my phone for email triage, that’s a problem: I need to be able to review messages, delete the irrelevant ones, respond to the few that need immediate responses, and star important messages for later followup. The Windows Phone mail client has a “flag” status, but it doesn’t sync with Gmail’s stars and I can’t seem to access this status any other way. Another problem: There’s no easy “archive” button: I can only delete messages. Text wrapping is occasionally a problem in the mail client as well. Marketplace. It’s obvious that app makers are gaming searches in the app marketplace. The result is that it’s very difficult to find relevant apps. Example: A joke app called “Fart Nukes” shows up in the first few results for almost every search, whether that’s “twitter,” “camera,” “facebook,” “skype,” or “instagram.” (There’s no Instagram app, btw. And I have no idea if there are good photo-editing apps, because I couldn’t find a good equivalent of Camera+ or Hipstamatic.) Another frequent appearance: “Airhorn Ultimate.” It took me several days to find the official Twitter client. Also: There’s no Skype app. That’s just bizarre, given that Microsoft now owns Skype. Lack of core social features. The “people” hub is nice, in that it lets me see recent Twitter and Facebook updates from anyone in my contact list. Unfortunately, it lacks several key features. For one thing, it doesn’t give me access to the groups or Twitter lists that I really care about, so updates from everyone I’m following drown out those from the few I do want to hear from. I can create my own groups on the phone, but it should sync with the groups I already have. For another thing, there’s no easy way to “like” or retweet items in this stream, making it frustratingly read-only. CORRECTION: @J4rrod informs me that I’m a joke. In fact, you can “like” or comment on Facebook items, and you can retweet (system retweet, not modified retweet-with-comments) Tweets. However, I don’t think you can repost a Facebook item to your own timeline, and you can’t retweet with comments or favorite a tweet. I stand corrected, partially. Google Voice. There’s no native Google Voice app, so I can’t easily place calls using my Google Voice number, and I need to use the mobile browser to access voicemails. Lack of multitasking. Not a major problem in most cases, but it was a noticeable problem twice recently. Once, when the Nokia Drive app was downloading a set of maps, and then when Runkeeper was synchronizing my workout data. In both cases, I had to leave the apps open for the entire duration of the sync operation. If I switched to a different app or to the home screen, it paused the update until I returned to the app. I’m not one of these fanatics who insists on keeping many programs running at the same time, but apps ought to be able to do user-initiated download operations in the background, so that you can continue using your phone during these lengthy processes. Now, most of these problems are probably easily fixable. It may be that there are user fixes I can implement for each of these, and if so, please let me know! This post is my first attempt to outline these problems and I will happily pass along any fixes I learn about. However, if I can’t easily figure out the fixes in the first couple of weeks of intensive usage, other people are going to be stymied by these problems too. My provisional conclusion is that if you use your phone to browse a wide variety of websites, or if you rely on Gmail, Twitter, Facebook, or Skype, Windows Phone is not yet quite ready for you. VentureBeat’s Jennifer Van Grove got a hell of a story this week when she dug into the data-handling practices of many iPhone apps, and found evidence that lots of them are uploading users’ entire address books to their servers, often without making that fact clear and sometimes without even encrypting the data. The New York Times cited her story and it even appears to have provoked a reaction from Apple, which announced the next day that it would start enforcing its rule against this kind of behavior. There are a few apps you could try to improve your Windows Phone experience. Try Carbon for Twitter, Thumba Photo Editor or PhotoFunia for photo editing and GoVoice for Google Voice. As for Windows Phone apps for Google services in general, it seems Google, not developing Windows Phone apps and lacking 3rd party developer support, is the serious obstacle here. I’d also like those GMail features integrated in possibly the best mobile email handling. 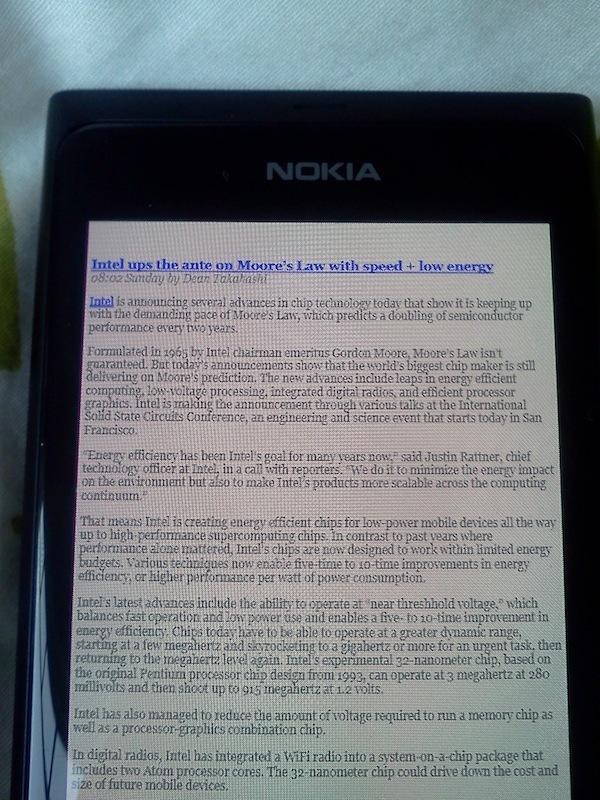 Until then, mail.google.com works as expected in IE9 mobile. Let’s hope IE 10 mobile has better text wrap. Microsoft is dogfooding the Windows Phone Skype app. ETA Q1 2012. Full windows Phone 8 Skype integration ETA Q4 2012. You are right. Apps should be able to download in the background. Multitasking like in iOS recently came with Windows Phone 7.5. Not all 3rd party developers use it in all apps yet. When I search the Marketplace for Twitter, the official Twitter app is the first app I see. 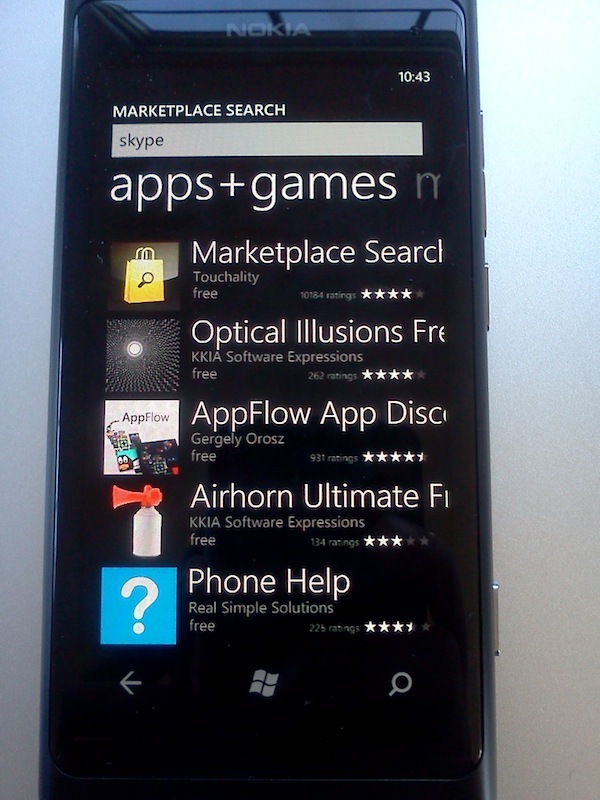 Anyway, you can also use your PC and the Windows Phone Marketplace website to browse other apps you need or would like to try and install them to your phone. Or try the AppFlow App Discovery app. AFAIK, iOS and Android require apps for most of the social features Windows Phone has integrated. So why is that a serious obstacle? If you need more social features, just use apps, like on iOs and Android. http://msdn.microsoft.com/en-us/library/hh202955(v=vs.92).aspx). It would be up to Nokia to support that functionality in its GPS app. There are some limitations that they may have wanted to avoid (for example, for downloads over 100 MB, the device must be plugged in for background transfers to run). I am curious how you are searching for the Twitter client in Marketplace. Are you browsing by area and scrolling, or are you using the search bar? I can confirm what @Forrestall wrote, that typing “Twitter” yields the twitter app in the first page of results. If you are just browsing each area, I agree the most popular apps aren’t always the most useful, so you have to do some serious scrolling. I think with Twitter built into the OS (in the People hub) and and with so many super Twitter clients, the official Twitter app is probably not one of the most downloaded. I am searching in the marketplace. I did find the Twitter app — I was just struck by how many obviously non-relevant apps also showed up on the same page of search results. In fact, the Twitter app is about the same as the Twitter app on other platforms — that is to say, it’s adequate, and it’s better than the built-in Twitter support, but it’s still got problems. Carbon is actually quite good. The Facebook app also works fine. So I suppose if I ignore the built-in Twitter and Facebook features and use their respective apps, Windows Phone is no more limited than other mobile OSes in that respect. I would expect more from the built-in features though. I still have problems with Gmail and Google Voice integration, and the lack of Skype support is still a drag.